We carry mens and womens boards from Burton, Never Summer, Lib Tech, Arbor & GNU. We have rocker boards, camber boards and hybrid boards in a variety of sizes and colors. When you buy skis or snowboards from us, we will set them up and mount them for free and your tunes and waxes are FREE for the remainder of this season! 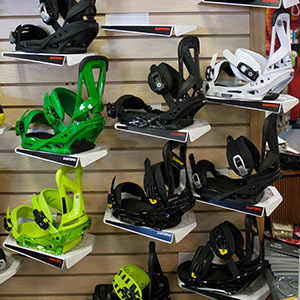 We carry mens and womens bindings from Burton, Arbor, & Flow in a variety of flexes, features and prices. We have bindings that will fit any board on the market today. When you buy bindings from us, we will set them up and mount them for free!